Below are the most current maps of the Watersound Origins community. Visit the Sales Center at 136 N. Splash Drive for additional information on available homesites for your Watersound Origins home. The proposed Amenity Expansion provides the opportunity for a new family pool complex, sport courts, and gaming pavilion. Additional phases of the plan will be developed in phases and is dependent on community growth. 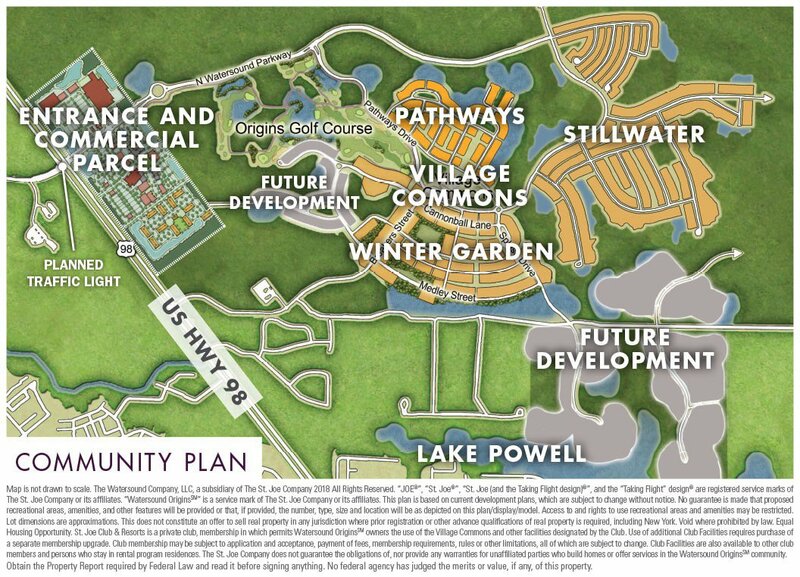 Adjacent to Village Commons, the Pathways neighborhood has several parks and ponds and offers homes from by local builders Huff and Romair. Now Selling! With homes from the mid $300's - the Stillwater neighborhood offers a diverse variety of homes in Watersound Origins newest neighborhood.